Over the duration of EDL 820 I have found myself thoroughly much more reflective in nature than in past classes. Thinking about the different leadership styles that are at our disposal when we are in roles that grant us the fragile ability to lead is daunting. What everyone in a leadership position needs to remember is that we have tools at our disposal that we can use in every situation. I start with leadership because in order to effectively implement the change that my partner, Scott, and I would like to integrate into education we need to use different strategies throughout our process. Whether that is in creating tutorial videos for ed tech programs, creating a briefing that we will use to sell our ideas to the staff, division, and ministry as well as our customers, parents and students, there will need to be qualities in our leadership that will need to shine through and some that we will need to put in our back pocket and save for a job more suited to that style. This is the juggling act that I enjoy as a people person. This project has vastly opened my eyes to the processes that one goes through in order to implement a change within a business. Identifying factors that are currently working in ed tech in education and what was lacking was very telling that there is a gap that needs to be bridged. If there is to be sufficient use of ed tech programs with staff, students and their parents why wouldn’t there be a training process in place for each program? At least when one is given the basic functions of a program they are able to create and explore within it further and create work that is transformative as opposed to simply utilizing these tools as substitutions. 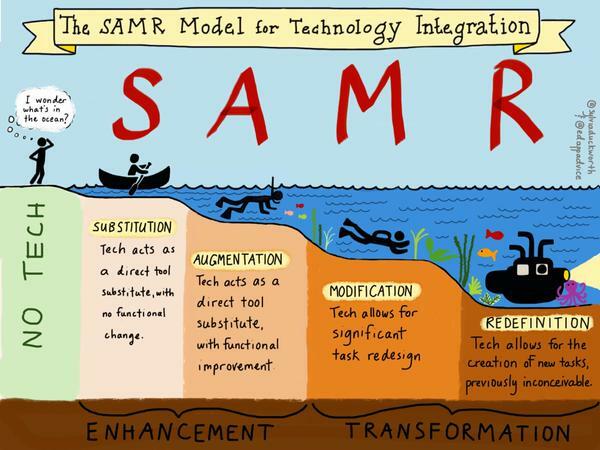 This is simply outlined by the SAMR model and is one reason we would like to see a change in ed technologies training. If our educators were properly trained and used these programs such as Google Suites and what it has to offer there will be a greater buy-in from staff members as well as the student population. In terms of funding for a program such as the one Scott and I are proposing there might be little, as educators we would be on the clock already being paid a salary wage, no loss there. There are also programs online that have assisted us with the ability to create video tutorials for each of the programs. Screencast-O-Matic is a free program that will record the screen and what you are working on. It had a 15 minute limit per recording but that makes it easy to break training tutorials into manageable chunks if need be. The downfall to this program is the ability to edit, you can pause the recording then record again but you need to have your content well organized in order to execute this well. It is an idea that Scott and I used in our major project, and we have been happy with the results of the tutorials we have created with Screencast-O-Matic. Funding that might be spent on a project such as this could then possibly go towards more devices for schools so that they are able to get closer to a 2:1 or 1:1 ratio for students. With proper training in place, we will also see a shift in the resisting population of educators. When there is competency with technology-based programs resistors will start to become change promotors and will engage in further learnings with new technologies that may be used in the classroom, this is where we would have an educational technology community of practice. This is where a Laissez-Faire approach will benefit both Scott and I. We would be able to let other leaders within the realm of the division host their own training and sharing groups for ed tech programs they have found and want to learn more about. With the different community of practices in place, staff will be furthering their competencies with other educational supportive programs and garnering a greater curiosity among colleagues from across the division. Ultimately Scott and I have created the crucial beginnings of a program that could have a great impact on ed tech training. I like to think of it as that crucial first domino that is being knocked over to create proper training for ed tech programs that educators are able to utilize in their classrooms. Once this is done it creates a model for future training in newer technologies for teachers. It is difficult and stressful for teachers to use these programs when there is little to no training for them. In our eyes, this will be a great step in the right direction for education and technologies within it that will relieve teacher stress when trying to navigate them. Major Project Blog #3 – And We’re Off! Taking the first steps to begin final assignments is always the most challenging aspect for me. I always know what I want to do and how I need to execute it, but I always struggle with finding a starting line. For our major project, I had the same issue, and it was especially difficult because there are a number of different aspects of our project. We have a number of different aspects to the tech change that we want to instill, for the better, for our schools and the division. Ultimately evolving the understanding of certain board-certified programs for teachers, students, and parents so they are easier to understand and use. There are a number of different aspects of this process that we need to tackle. Organizing where we are headed and how we get there… the first steps I struggle with. Luckily my partner Scott is pretty much a master when it comes to setting up a skeleton for projects such as this one, so that really helped me become stronger in an area I struggled with. Because we are looking at creating a training program for ed tech programs that are to be used on a regular to semi-regular basis we needed to come up with a blueprint for our project. What will it look like and how will it be delivered? We came to the consensus that there needed to be an initial presentation that will be put forward to the Ministry, Division, educators within the division and its parents. This presentation would cover most aspects to implementing new training such as a SWOT (Strengths, Weaknesses, Opportunities, and Threats) analysis, engagement with each level of Education, engagement with change promotors and resistors, etc..
Our training will then be done with teachers with the assistance of tutorial videos for each program that teachers will have access to on a regular basis. These tutorials will take educators through the implemented programs and equip them with the knowledge they will need to effectively utilize them in their classrooms. The tutorials will give teachers the confidence they need to use the programs, they will be delivered as video’s so teachers can see what is going on, they can be paused, rewound, and will be accessible throughout the life of that technology. This will also give educators the opportunity to become experts with different programs and equip them with some troubleshooting capabilities that might normally take time away from teaching. When educators are properly equipped and trained with the tools that we are given to enhance our educational experiences, stress and workload are affected in a positive manner and we become more efficient at our jobs. In an article entitled, The Impact of In-Service Technology Training Programmes on Technology Teachers, Gumbo et. al state that, “The findings revealed that teachers overwhelmingly benefited from the training in terms of their knowledge and understanding of technology.” (pg. 30) This is massive in a profession where the workload can be overwhelming. Why wouldn’t an investment in proper technology training be implemented? With these realizations and the fact that front line workers in education, teachers and students, will benefit from proper training, we are quite confident that a training program such as the one we are proposing will be welcome and instill a confident competency among its users. This will also increase the use of programs that are certified from the School Board, and educators will feel more confident with the implementation of future tech programs. As stated in my first major project blog, the area I want to impact in regards to education technology is that of proper training for teachers and students. I wanted to implement a training process that would see four modules in place throughout the year to help the school community gain greater expertise with the programs that are going to be utilized and implemented within the division. After chatting with a colleague Scott, we decided that we would work together on this project as we both had similar ideas for the major project. We came together and went over each of our proposals and came up with a more focused and detailed idea for our project that not only includes staff and student modules but includes parents as well. From here we decided to focus on the programs PowerSchool, Gradebook, and myBlueprint. These programs are used regularly throughout the school year and are utilized by all three parties involved with the exception of myBlueprint. There is also a push from the Board office for educators to use these programs throughout the school year. And finally, a reflective target to set goals for the following year. We felt that if we had these six targets it would set up a solid foundation for training and understanding for these programs, as well as those that may be used in the future. Scott and I were on a roll. And then it happened, the unthinkable…We became stumped, our brains working overtime, two fathers with a lack of sleep had a real struggle with the assessment aspect of the project. Personal and External assessments, how to measure success in an area, how do we know it’s working, how do we obtain data to measure said success? This took a lot of pondering, the type Winnie the Pooh does! Personal assessment was a difficult package to unwrap for us. Trying to find different ways to measure the success of the different modules was a challenge. When we look at the success of programs we look for the concrete data, the analytic numbers that will show success, so we had to try to find different avenues in order to tell whether the targets would be successful. We did finally come up with some different ways to assess the success of the targets such as a decrease in e-mails and questions from staff and parents. When there is a reduction in the number of questions being asked about programs and how to properly utilize them, that alone is a measure of success in the delivery of training of the program. Another area that we thought would be measurable in personal assessment was the increased buy-in from staff to use technology. This is an area in which there has been resistance within the building I currently work, and it’s simply because of the lack of training with new programs. External assessment we found a bit easier. When looking at the specific programs we were targetting, such as myBlueprint and PowerSchool, administrators can go into these programs and monitor student progress as well as parent usage. With access to program data in which you can check student progress, you get a greater understanding as to where students are at and what you may need to work on moving forward to harbour success in students lacking in the usage and completion of the educational technology. Once Scott and I had wrapped our heads around our understanding we felt like we had created a solid plan for our major project. Proper technology training for everyone involved in education will create an environment where the educator can become an effective facilitator of learning, students will become more familiar with Board initiated programs, and parents will be able to effectively navigate and utilize PowerSchool. With these goals in mind and the targets we have set I believe there will be an improvement in teacher competency, student growth, and parent engagement. For the first part of our major project, we were asked to create a proposal about an area in which we would like to influence in educational technology. There are many different things that could be done differently and more efficiently within education technology, but the one aspect that could be focused on the most is that educator training with new technology. It wasn’t too difficult a task to choose an area within technology and education to start thinking about what changes could be made. The biggest aspect that is missing is proper and efficient training on new technologies that we are to utilize to enhance everyone’s educational experience. With new technological tools being created and integrated into our school systems each year it is important that divisions are making wise choices as to what programs they will be implementing to meet the needs of their teachers, students and parents. This is a great way to move forward in education, but there is one key aspect that is missing when we get these tools and that aspect is the lack of proper training for staff to successfully integrate the technology into their lessons. My proposal for a change in educational technology training is a four module structure that includes students in three aspects of the training process so they along with their educators can become experts with the technology. Module One – Teacher training in a PD session at the beginning of the year. Module Two – Session in class with students and teacher setting up accounts and exploring new technology and what it has to offer and how it functions. Module Three – Teacher and students utilize the programs and ask any clarifying questions they may have about the program. Module Four – Reflection for teacher and students that gives them the ability to provide feedback on the new technology. These modules would all be completed with an expert from the division. There would definitely be some wrinkles that would need to be ironed out, but with the active support of an expert visiting the school and engaging with the teachers and student body with new technologies, there would be an increased level of engagement from each party. Teachers would be more apt to utilize new technologies within their classrooms and feel confident in doing so. This will also alleviate the stress of the learning leader on a staff when a number of colleagues are constantly coming for assistance and questions about new technology. It was fairly simple to choose an area I would have liked to influence, technology is an important aspect in education. What would be difficult about this is the fact that the school division has a lack of funding that they would need to start this program up and keep it running efficiently. There would need to be a good number of experts on the technology that would be able to coordinate visits to each school, 3 times, throughout the year. It would be a good investment that would harbour confidence, curiosity and eagerness among staff to utilize technology in the class. There are many avenues that could be explored within technology training, but I believe that the most effective way to train is to include all of the parties that will be utilizing it (Staff, students and parents). Through this, there should be a greater willingness to use programs from staff and a higher engagement from the students as well. and one of the most important aspects that is missed when introducing technology, in my experience, has been the feedback piece. How do you know how well a program is working without staff and student feedback? Is it easy to use? further questioning creates greater expertise! I know that this is an area that will not change soon but in a perfect world we can ask clarifying questions and get a quick response, we can become experts with great human support resources to help train us and students to utilize the different programs we are given properly and successfully. In this weeks post, we were asked to share some ed-tech stories from around the world and how they are working. I have chosen to look at the ever-evolving virtual reality and augmented reality technologies and how they are working to enhance educational experiences for students and teachers. Virtual reality (VR) and augmented reality (AR) are quickly becoming technological tools that are being implemented into classrooms across the world to help with student engagement and learning. With these tools, education is becoming more experiential for all students. Textbook learning has become or always was, stagnant and boring for most students. With the implementation of some VR and AR programs education is beginning to evolve into a more engaging and hands-on tech-based learning experience for students who have the privilege to use these tools. So, what is virtual reality and augmented reality? Augmented reality is when we look through a lens, for instance, our phone screens, there is an element that is being added to the reality we know. It is altering or enhancing what is available to us in terms of educational experiences, entertainment, productivity, etc. In Nova Scotia classrooms are utilizing VR for science curriculum looking at the human bodies. The tools that they are using to make this possible are their iPhones and a cardboard VR headset. These headsets can be quite cheap, around $10-$20 per set. Funding can be an issue, but it is in most aspects of education so this might be a cheap way to get around having to buy top of the line materials to supplement learning with. There is also the issue of devices to run the applications from, not every student has one, but every class I have taught there have been approximately 50% of the student population that have had them. Sharing is caring when partnered up and that is the way I could see VR working within our school systems. It is not perfect, but I liken it to computers per student ratios at times within schools, sometimes there are not enough and that’s when small group work starts to flourish. AR is much the same when it comes to tools but is quite a bit different than VR. Programs that alter reality behind screens and enables users to experience their work coming to life, such as an art project, It can give life to something that students might find rather boring. The following video is a good example of what AR technology is capable of. As technology becomes more prominent within our daily lives and societies it is important that education is paving the way for success within these realms. Not only will there be a greater student engagement level but student achievement would climb as well. Utilizing new tools is incredibly important in education and when utilizing AR and VR we can enhance experiential learning to new heights and students would appreciate that. The biggest thing educators have to remember when implementing these new programs and technologies it the fact that their needs to be a reason/context to the exploration and utilization of these tools. If that is not the case any tech advancement, when used improperly, is bound to fail. Using AR and VR properly with guidance and outcomes will enhance the education and engagement of many students. With the growing need of technology within our society and the skill involved in utilizing the vast array of programs available to educators, students and the community, it is of the utmost importance that skills are gained and grown with the use of different technologies throughout education. Digital literacy has become an important aspect of education that has yet to be included in the curriculum. Education climate changes and so too, do the tools in which are utilized within the different realms of the professional world. So why is this not a part of our curriculum if it is a “fundamental literacy”? I completely agree with their sentiment. Many of the people I know or have come across in this lifetime rely on technology within their profession in many different ways. This says something about the ever-evolving state of the Saskatchewan curriculum. In the eight years since I have been out of the Education program, teaching, the curriculum has stayed the same… This is an issue especially in when we are in the business that is centred on the minds and growth of the next generation. There should be additions, subtractions and alterations that need to happen within the current curriculum to include the use of technology. If the use of technology is a fundamental literacy it needs to be implemented within the curriculum. What a great idea! My issue is with the disconnect between this message and what is really happening within schools. Don’t get me wrong, there are a number of schools that have educators that provide digital citizenship lessons for their students, which is great and a step in the right direction. There are however educators that do not incorporate digital citizenship into their year or simply graze over it. I then am led to wonder why this is not part of the curriculum? This is such an important skill that needs to be discussed and taught early. What students put online will follow them and that could be the difference between being hired for a job or passed over. This is going to be a difficult task for school boards. Although there are computers within each school, they are shared among classrooms. There is then the issue of booking them out, last week, for instance, I went onto our staff computer cart document and was unable to book out the carts for the week because they had been booked out by other classes for the periods that I needed them. In a perfect world, students would have 1:1 with tech, heck I’d be happy with 2:1, but this is not the case and what is standing in the way of equity of these devices? Funding. Until the Province has the realization that the future is moulded through the education system, this sector is always going to struggle to afford the tools needed to harbour student engagement and success. After all, what is at the heart of education? Student learning, engagement and success! Technology is a great tool that is at the disposal of many educators throughout the school division I am currently working in. With innumerable uses within education, it can be a daunting task for teachers to implement them within their learning environments with little to no support. And with this begins our scene. Benjamin Joseph Andrews (***Fictional Character***) Walks into his classroom, first class on the left in the portables of Forest Grove Elementary. He is a grade ⅞ teacher with a class size of 28 students. Ben walks to his desk, where he puts his extra-large double-double coffee from Tim Hortons. He opens his brown leather satchel and pulls out his board certified, HP computer, although he has had it for the better parts of six years it still runs quite smoothly. He powers it up while unpacking the rest of his belongings for the day, computer charger and a fiction book he has been reading about one of his sports heroes. The blue welcome screen pops up and asks him for his password, he types in DolphinsRule26, the 26 represents how many times he has had to change his password over the past five years of his career. Ben then proceeds to open his e-mail where he finds out that he is to implement a new technological program that he is to utilize in his classroom for this year. There is an attachment, its a word document, that contains step by step instructions that seem to become more confusing the more he reads them. Ben: What? How am I supposed to use this thing? Ben clicks on the link taking him to the new education blog site. It takes him to a screen that says “YouBlog” (***Fictitious blog site***). He has heard of this newer blogging technology but has never used it and is beginning to feel a little bit of anxiety creeping into his body, he thought he had this under control…With every new technology implementation, he always had the same feeling. He quickly enters the site and tries his best to navigate his way around setting it up and creating a class site, with growing frustration. He has lost track of time and the bell rings, students begin to flood the halls and pour into their respective classrooms. Ben is sweating and flustered, he takes attendance then has his class begin the day with silent reading, to increase their fluency and comprehension. He dives back into the world behind his screen and struggles to continue to set up the site properly. Lucky for Ben he has computers booked out for the period, scraps his plans and decides to have the students begin to tinker with this new program that he just learnt about from the Word doc. Most of the students struggle to create an account and need one on one help from Mr. Andrew’s. There are a few who think that they have things figured out, but have forgotten how they had gotten to certain points when trying to assist fellow students who are struggling to create accounts. Ben looks up and around his class at all of the organized chaos and chalks the lesson they learnt this morning to the importance of community. Although he was happy with the way his students worked together and tried to problem solve they really got nowhere with this new program. Despite Ben’s ability with computers and other programs, he was left with deep frustration. A couple weeks pass and he has managed to get all of his students set up and their accounts. He goes through a couple more rough patches with the program even though he has spent numerous hours outside of school trying to master this site and has struggled to get a grasp on it. He has sent tech support emails with different questions that do not often get answered until a day later, he has voiced his concerns about implementing programs and not receiving ample training for the proper use of them. Ben, frustrated, wants to help make a change for the better, he has suffered enough with new programming and a lack of training. He no longer wants to tread water in the ocean, he would prefer to be sailing on a yacht of program knowledge so he can help his class properly implement new programs without feeling his airways start to close and the feeling leaving his limbs everytime a new tech program is implemented. Ben has come up with a module based learning program for all teachers and students throughout the division. Module one: Training for teachers. This would happen either at the board office or at a school. A specialist would assist in educator learning about the program and how to set it up. As well as answer any troubleshooting questions that teachers may have. This gives them a comfort level with the newly implemented program. Module two: A specialist comes to the school and works with classes to have students create their accounts, the set up of their sites, and guides them in an exploration of the program and how it should be utilized. Module three: Said specialist comes back and talks to the class about how the program is working and answers any questions teachers and students may have with the new technology. They look at how it has been used in different classes and again are able to answer any questions that come up about the program. They can also start to show other ways in which the technology can be used. Module four: A specialist would come out for the last time in the school year and review how the program was utilized in classrooms. They would take feedback from teachers and students. Ben is happy with his plan. Sure there are some aspects to iron out, but no plan is perfect and he just wants to get the ball rolling. Whether that looks like a program coach or a module-based program with a tech expert in the division. Ben knows how important technology is for the students in his class and for their futures and wants to implement technology into his lessons, but wants to do it properly. He takes his plan to his administrator to see if he can get the ball rolling and is told that it looks like a great idea, but there is not enough funding for a program to be in place, such as his. Ben’s looks to the floor, frustrated, then asks, “Would you mind if I sent this idea to the board office? Could you show our superintendent?” His principal looks back at their computer screen at the proposal and takes a moment to think, looks back up at Ben. The acknowledgement meant a lot to Ben and he is excited for the future and what that might mean for technological programs within the classroom. He knows there is a massive lack of funding within education for programs like these, but knows that something like this is needed. He goes back to his classroom, sits at his desk, and notices and e-mail from the superintendent and opens it….